On Friday we took the kids trunk-or-treating ﻿in Kalaheo. The kids had a lot of fun playing games and admiring the costumes others were wearing. Of course the best part of the night for them was walking by all of the cars decorated for Halloween and getting candy. Emilia's bucket was so full she didn't even want to hold it because it was too heavy. Emilia has been wanting to dress up as Snow White for a long time. I tried to convince her to dress as Cinderella but she had made up her mind long ago and nothing could change it. She made an adorable Snow White. This was Carson's first Halloween. 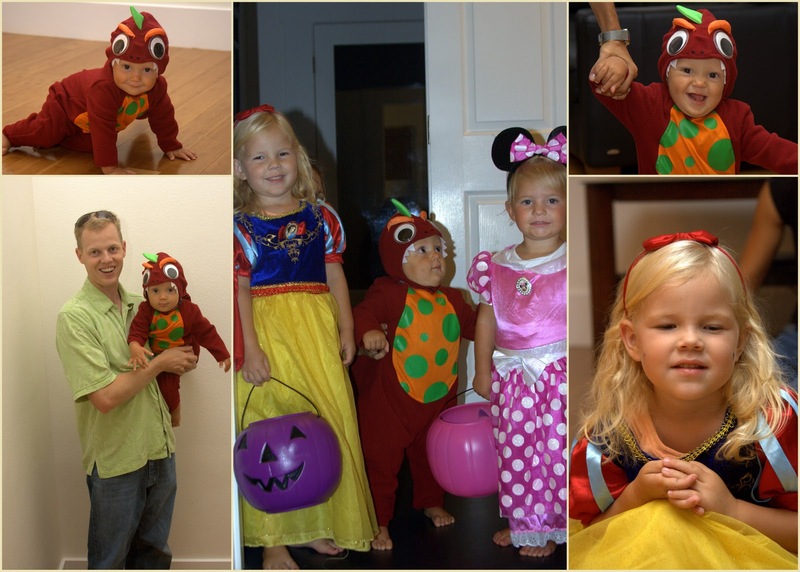 He was dress up as a dinosaur/dragon. As always he was an excellent sport. He didn't mind having to wear a hat with a tail attached to it. It hardly feels like fall here in Kauai. It was really strange to celebrate Halloween in such warm weather.